Green defence initiatives are often borne out of the desire to untether the military from exorbitant fuel requirements. In addition to being seen as cost-reducing measures, interest in green defence stems from a desire to mitigate operational risks, such as attacks on fuel convoys, that jeopardise troop safety and sometimes to increase energy independence. With these drivers in mind, this policy report comments on green defence initiatives undertaken to date, namely in the United States and Europe. The report then turns towards green technologies and identifies those with military applications. First, it looks at green technologies that have prototypes or have been deployed — namely, camelina-derived biofuels, methanol-based fuel cells, hydrogen energy, hybrid electric drive and photovoltaic energy — and weighs the pros and cons of each for armed forces. Next, it looks at three other potentially green technology areas — pulse detonation technology, piezoelectricity, and biodegradable platforms — with lower technology readiness levels. The report concludes by looking at three ways that green technologies can affect the operational and organisational elements of forces of the future. 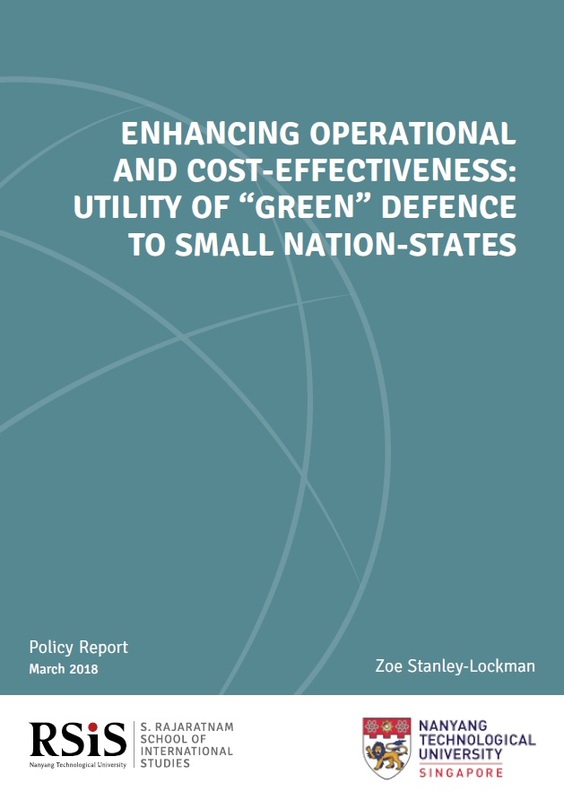 Based on the experience of some of the bigger players discussed, it recommends that the armed forces of smaller nation-states interested in green defence avoid prioritising short-term economic arguments at the expense of long-term operational advantages. Zoe Stanley-Lockman was a Visiting Fellow in the Military Transformation Programme of the Institute of Defence and Strategic Studies (IDSS) at the S. Rajaratnam School of International Studies (RSIS). Zoe holds a Master’s degree in International Security with a concentration in Defence Economics from Sciences Po Paris and a Bachelor’s degree from Johns Hopkins University. Prior to joining RSIS, she spent two years at the European Union Institute for Security Studies (EUISS), first as a Junior Analyst and then as the Institute’s Defence Data Research Assistant, researching defence-industrial issues, arms exports, innovation, and military capability development. Throughout her studies, Zoe’s practical experience included working on dual-use export controls with the US government and consulting for defence contractors.